The original Samsung Mini, released almost exactly a year prior to the mini 2, had very few points in its favor and the level of equipment wasn't among them. But it was cheap and it had Android. This made it a good option for anyone looking to see what all this smartphone business was all about, but wasn't ready to sell their firstborn in the process. The mini 2 finds its market niche in the same vicinity as its predecessor, although this time around Samsung have boosted the specs to something more respectable, adding a higher-resolution screen, more storage and RAM, and a faster processor. As is usually the case when recommending a device which is clearly aimed at the budget market, the most important question is: how budget is budget? Right now, the mini 2 can be had for about €160 in most markets. While this is fairly cheap, it's not the lowest price we've seen on an Android-powered entry-level device from Samsung. The Samsung Galaxy Pocket costs around €100, and is a safe bet if you're looking for a new smartphone and low price is your only criteria. The screen has poor resolution and pixel density, making it a bit of a hard sale (not to mention its QVGA video recording at 15fps), but if you want cheap, it's a hard price to beat. If you're comfortable with the mini 2's price range, there are several other offerings to consider. 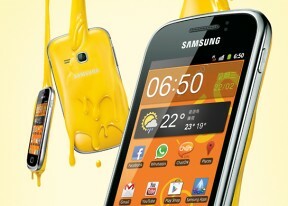 Last year's Samsung Galaxy Gio shares the same screen and general size as the mini 2, and can be had for around €130. It's upgradeable to the same Android Gingerbread version as the mini 2, and has the same 3 MP camera as well. If video recording is your thing, then the scales tip slightly in favor of the mini 2, as the Gio is only capable of QVGA@15fps. Storage and RAM are also a bit of a factor as well, as the Gio only has 158 MB of internal storage (although Samsung do include a 2 GB SD card in the retail package) and less RAM than the mini 2. HTC and LG offer a couple of devices which also compete in the budget market. The HTC Explorer and the recently-released LG Optimus L3 are both slightly more vertically compact than the mini 2, although with slightly inferior screens. The L3 has a 240 x 320 pixel display with support for up to 256K colors, and while the Explorer shares the HVGA resolution of the mini 2, it too has only 256K colors. Both devices can be had for around €120, although each has smaller storage capacity when compared to the mini 2, so you'll probably want to factor in the cost of a microSD card into your purchase as well. Samsung has had plenty of practice in perfecting the Gingerbread OS across a wide variety of smartphones, and its experience in optimizing Android 2.3 really shows in how well the processor is able to keep up with the UI. With the exception of the occasional hiccups in web-browsing, the responsiveness of the mini 2 is pretty good. The mini 2 should be both grateful and wary of the Galaxy Pocket. The Galaxy Minis are no longer at the bottom of the food chain but they had to surrender the "cheapest Android" title as well. The Galaxy Pocket is easily seen from across Dumbphone street, while the mini 2 joins the swelling ranks of affordable droids of which Samsung never seem to get enough. The yellow jacket however, is easy to spot from afar.